It is not only the ravages of time, vandalism, lack of money, and overzealous planning commissions that endanger North America’s remaining neon signs. 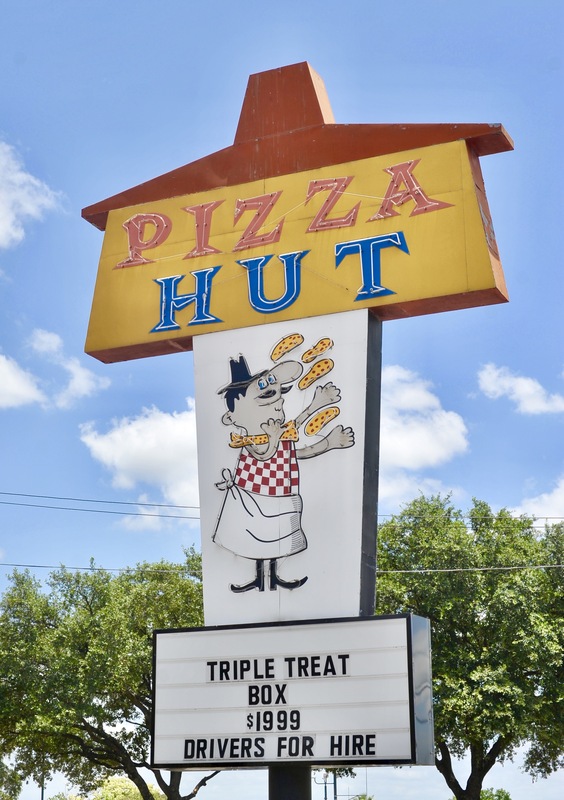 In a tale similar to one I told here a little over a year ago about Dairy Queen, the corporate big-wigs at Yum Brands that now own Pizza Hut deduct 100 points from every inspection they make of this location because it has kept the 1969 sign with Pizza Hut Pete. Thankfully, the owners keep it in pristine shape and even took it with them when they had to move to this address. Yes, I certainly understand the desire for consistent branding. I know the need for it myself as an old radio guy…that’s why music stations now play an ID after almost every song because research shows people actually do forget what they’re listening to (which might also explain the United States’ current political condition but that’s another rant for another day). It’s just a shame in this time of more enlightened preservation of mid-20th century architecture and signs that, even with an owner willing to pay the huge extra expense of maintaining an old sign, it is seen as a drawback in the corporate boardroom. One can only hope the directors of Yum Brands will continue to allow this exception to shine on into the San Antonio night…not to mention ever mess with Pizza Hut Pete the way they have with poor Colonel Sanders. Posted in 1960s, Food, Retro/Vintage, signTagged Americana, Italian, neon, nostalgia, photography, pizzeria, restaurantBookmark the permalink.